I had a somewhat interesting experience the other day. The interesting bit about it was, that as far as I knew, I was not under the influence of any drug or psychotropic substance. My initial thoughts when I noticed what was occurring, was that the experience was very much similar to spacing out while under the effects of a chemical compound such as Tetrahydrocannabinol‎ (THC) but more towards the spacing out after consuming a member of the Psilocybe family of fungi. While not as extreme as the Psilocybe experience, it was still very surprising… mainly because at that point in time I was not expecting anything of the nature to occur, nor had I ingested any mind altering substances for a fair amount of time. Of course, being some sort of a paranoid type, I started to attempt self diagnosis by Internet (which is typically a bad idea since symptoms of all kinds tend to overlap with all kinds of medical conditions and diseases). The fact that I basically had only a single symptom to work with didn’t really help much either and I ended up with a self diagnosis of early onset Alzheimer’s at the age of 33. On the bright side, my self diagnosis accuracy up to this point in time has proven to be 0% – so I probably don’t have Alzheimer’s. Anyway, here’s an attempt at crowdsourcing a diagnosis… I’ve attached a number of graphs below which attempt to describe attention (in percent) versus time. Note that the time axis is in seconds and is in no means to be a 100% accurate reflection of the experience, but is more there to give a relative idea of time rather than a definitive measurement. I’d also like to add that these experiments did not break any laws of any kind and experiments with substances were conducted in a country where consumption is legal. Here’s what I would describe as my “normal” attention levels during a conversation. Think of 100% as the level of concentration you would have when attempting to solve some kind of mathematical equation (or whatever floats your boat). So in this case, my attention hovers at about 75% and spikes slightly to 90% when being asked or answering a question. This graph of course may not make sense to some people, and even to people who are familiar with these chemicals, well, let’s just say that the effect isn’t the same on everyone (so don’t take this as medical fact). Note that there are levels that are above 100 and below 0 in this graph. During the “coming down” (as I like to call it) phase of Psilocybe especially, I find that it’s difficult to focus on things; the peaks above 100 are essentially my mind attempting to focus and hold on to something (an object, a conversation, anything) before slowly slipping and eventually sinking like a stone. At the point where my attention goes below 0, I’ve essentially completely lost track of whatever was going on previously; this typically means I’ll suddenly become aware that I’m staring at some random object and have absolutely no clue why I’m staring at it in the first place, or in the case of a conversation, have some difficulty fashioning a more appropriate reply that a thoughtful grunt unless some reminding of the conversation thread takes place. When the consciousness or attention returns, it’s quickly followed by an immediate spike up to 100% (or more) where the mind basically attempts to get back up to speed with what’s going on… before repeating the entire graph again… and again… and again. This is the scenario that has me somewhat perplexed and is the focus of this post. As can be seen in the graph, the attention levels hover at relatively normal levels for the most part. 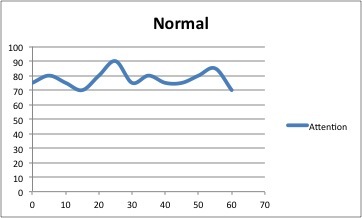 Occasionally though, the graph dips to 0 (but does not pass 0). The best way to describe this is in comparison to the previous graph (Psilocybe). 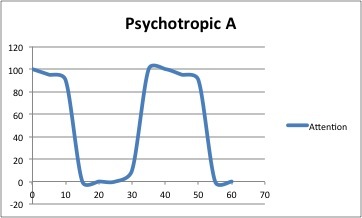 While the Psilocybe graph shows attention dipping to below 0, which represents a full on break of the thought process (a “1+1=” followed by a break would not yield an answer), the Scenario X graph does not actually break the thought process. Rather, the thought process recovers at the point just before loss of the thought process. Essentially, the first thought after the dip to 0 is “Whoa, I was about to space out there” before recovering to normal attention levels (and then repeating the process). 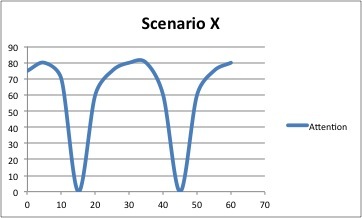 I think the key details that should be kept in mind when comparing “THC/Psilocybe” and “Scenario X” are that (in my case), the time frame for a repeating Psilocybe graph would be for many hours (up to 10 hours – and yes I may have taken a wee bit too much for my size), while the “Scenario X” graph only repeated (and lasted) for approximately 2 hours. The other detail worth noting is that the Psilocybe graph isn’t something that I was able to “opt out” of, and was essentially a hang on until it’s over experience. “Scenario X” seemed to only occur within the confines of a certain location and the effects felt quickly dissipated (within minutes) of leaving mentioned location. I wasn’t aware of anyone else present experiencing similar… experiences for lack of a better word, although it’s entirely possible that everyone else was, since it would be technically difficult (if not impossible) by observation alone to see if anyone else had sudden dips in attention levels (and even if they did, to what level). I’m “fairly” certain that this isn’t a “life-threatening” disease of some kind, and could easily just be lack of sleep (or too much sleep), or something equally mundane. That said, it’d still be interesting to attempt to form a diagnosis of some kind (whether accurate or not) and observe the process. Questions, thoughts, and all such things are welcome. This entry was posted in Uncategorized and tagged add, adhd, diagnosis, medical. Bookmark the permalink.